The 21 story Atlantis building is a project by the firm of Arquitectonica featuring a slim design offering all of the essentials and remains an optimum choice despite its years of existence. It's located right on Brickell Avenue in an eastern position that allows it unobstructed views of Biscayne Bay, Virginia Key and the island of Key Biscayne. Atlantis has all you need including a large pool area, Jacuzzi, a modern gym and even a tennis and racquetball court if you’re looking for additional athletic activities. 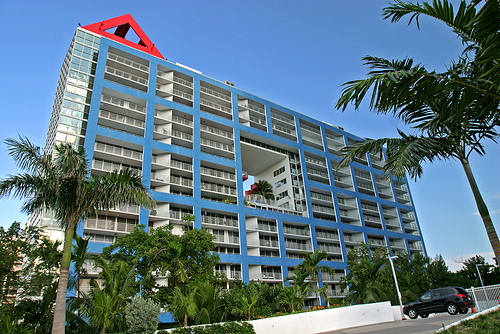 The 96 Brickell condos for sale inside of the building have two or three bedrooms and range between 1.304 to 3,384 when it comes to square footage. All of these features are rounded out by around the clock security and convenient concierge. From Atlantis you can explore the entire area of Brickell or visit Downtown Miami which is where you’ll find a number of restaurants and large scale attractions which include but are not limited to the American Airlines Arena, the Bayside Marketplace and much more. The Rickenbacker Causeway to the west of the building provides easy access to aforementioned Key Biscayne, home to a dog friendly beach area as well as large parks.